This week we have some great new iOS offerings, including several turn-based strategy games, a 2D physics-based racing game, a unique take on the hidden object genre and a long-awaited iOS release of a digital board game adaptation. 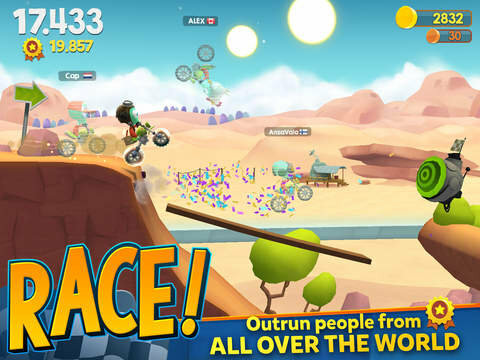 Let’s start things off with one of Apple’s featured titles, Big Bang Racing, a fun, 2D physics-based racing game that is a bit reminiscent of titles like Joe Danger and Mod Nation Racers. Players can select (and upgrade) either an offroad car or dirtbike and take on crazy tracks filled with hills, valleys, portals, electrified platforms, switches and more. Some tracks require you to race against three ghost opponents to the finish line, while in others you are trying to collect items and must find the proper way to navigate the course to do so. Big Bang Racing features a seemingly endless supply of user-generated tracks thanks to the super-intuitive and accessible track editor, which is loaded with lots of cool track elements which can be unlocked through a combination of play and in-game currency. The track editor so easy to use and it’s as simple as drawing the track with your finger to get started. As can be expected, with user-generated content, the quality of tracks can vary a bit, but players get to rate each and every course. If you are looking for a fun little distraction, this is one you can lose hours in. Next up is Chillingo’s, latest offering, Mahjong Fairy Tiles. 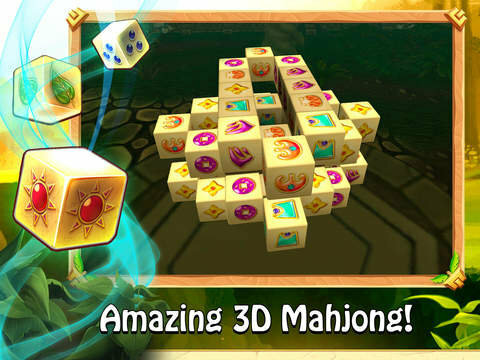 It is a timed 3D Mahjong puzzle game where players are try are trying to solve series of Mahjong puzzles to meet certain objectives before time runs out. You may need to solve a puzzle in 25 seconds, or perhaps 3 puzzles of increasing difficulty in under 80 seconds. Other times you may have to free X number of blocked tiles within a time limit or some other task which keeps switching things up to keep the player interested and ensuring that they are always frantically matching tiles. While in college, I played a ton of Mahjong on my PC, but then for whatever reason, sort of lost interest in it. However the third dimension of Mahjong Fairy Tiles coupled with the pressure of the countdown clock adds a neat little twist which requires the player to look at the board from multiple angles to find the best matches and has sparked my interest again. It is a nicely put together game with a ton of levels and so far the free-to-play aspects of the game haven’t seemed to noticeably hamper or limit my gameplay. 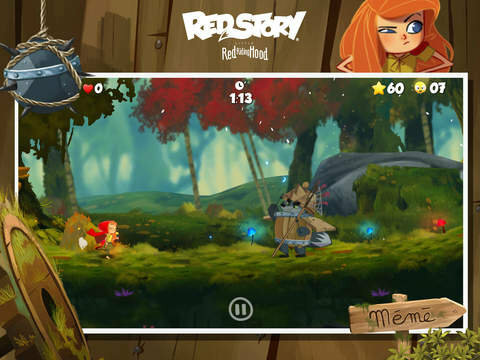 Beautifully illustrated, RedStory – Little Red Riding Hood is a new autorunner platformer in the same vein as games like Le Vamp and Lost Socks: Naughty Brothers. You play as Red Riding Hood, racing as fast as you can to reach Grandma’s house before that mean old wolf. Offering players a little more control than just usual single taps for jumps, swipe gestures are also used to occasionally interact with objects, slide under objects or switch direction. I say that this one is definitely geared more toward a younger or more casual audience. The familiar storyline and gorgeous graphics are likely to draw in players, but ads, hearts and fairly repetitive level design could give this one a shorter lifespan on your device. Deity: Elementals is a new simultaneous, multiplayer turn-based strategy game where players are moving around a shared grid of symbols triggering attacks, powerups, and healing and protection spells in an attempt to be the last man standing. On each turn, players have just 5 seconds to decide which tile they’d like to move to on their next turn (based on their current position and movement range). So you’ve got to be quick, but still strategic. A new row of symbols rolls onto the top of the board each turn, with the bottom most row disappearing. With the board constantly shifting you need to try to plan your moves accordingly to pull off some great combos and deal some devastating damage to your opponents. This one seems to have gone under the radar a little, but it’s definitely worth checking out. According to the App Store description, Deity: Elementals is currently free for the first 100,000 downloads so you’ll want to grab it ASAP. A neat take on the hidden object genre, The Hunt for Red Panda puts players in the role of an art detective/restorer who is trying to repair (real) famous paintings which have been defiled by the infamous Red Panda. Players are presented with a painting and they must identify the specified number of inaccuracies and blemishes. By tapping on the the spot you apply the reagent chemical. This tells you which of your correction tools you then need to use on the spot to restore that part of the painting. If you get stuck, you can use a hint and additional hints can be obtained by playing themed minigames. It was important to the developer to use real paintings. The CEO of the game’s development studio, Zagrava Games said: “The Hunt For Red Panda goes well beyond your typical hidden object game. 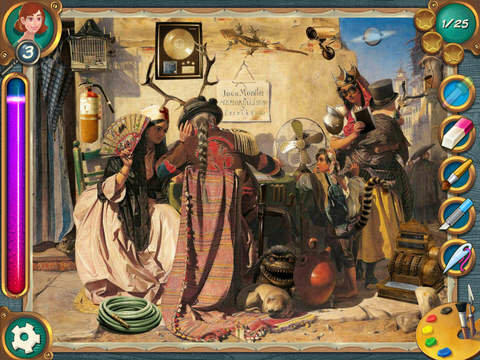 We want to instill in players the idea that paintings need to be appreciated and preserved for future generations — and to teach them (in a fun way) the basics of restoring important masterpieces.” I think hidden object fans and casual gamers will really enjoy this one. The Hunt for Red Panda offers over 8 hours of play and is currently available at a special launch price of 99¢ (regularly $2.99). 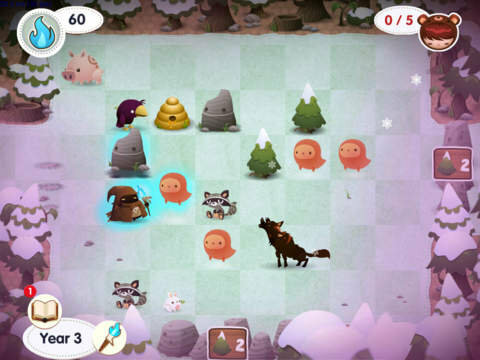 Next we have a charming new iOS ported game from Spry Fox, developers of Triple Town and Bushido Bear. Released nearly two years ago on Steam, Road Not Taken is a gorgeous and engaging roguelike puzzle, survival, adventure game which follows a strange ranger as he braves wintry weather to explore forests and rescue lost children, returning them to their loved ones. The game is played over a total of 14 years and at the start of each year you are told how many children need to be found. Any health you had from the previous year carries over to the next. At the start of the first year, you are given a limited amount of health. You travel through the forest, which is made up of a series of gridded screens, trying to locate the lost children and their mothers. On each screen there are a number of creatures, plants, trees, people, etc laid out on the grid. Access paths to other screens are initially blocked, requiring the ranger to use his magical torch to move a specified number of like objects (trees, logs etc) next to one other to open the passage. Most of the time, movement is free and doesn’t count against your health points, that is unless you are carrying an item. Items may be picked up or pushed using your torch to move them about the board. When pushed, the item will travel as far as possible in a straight line away from the ranger. Some creatures need to be avoided (or you’ll lose health). Other creatures and items can be combined to form new creatures/items. For instance, by moving 3 beehives togetehr so they they touch, they transforms into life-giving honey. By talking to other villagers and befriending them, you’ll earn items and special charms which may be equipped to give you special abilities, reduced damaged, increased health from items and more. Road Not Taken is a stellar new release on iOS, with plenty of gameplay and replayability and can even be played on Apple TV and at $4.99, it costs about a third of the Steam release. 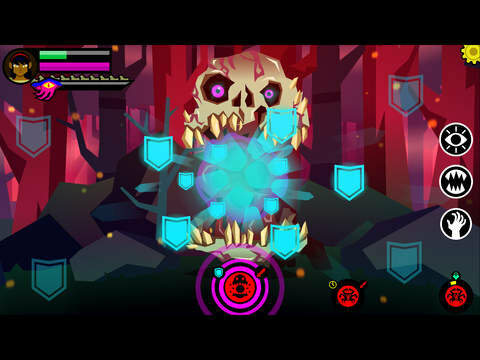 Several months back in April, DrinkBox Studios released a swipe-based, first-person RPG adventure game called Severed on PS Vita. Originally it was thought to be a Vita-exclusive but then they announced it’d be coming to mobile as well and now this week, the game has arrived to iOS. Players take on the role of a one-armed warrior named Sasha. Trapped in world of nightmares, Sasha is trying to find her family. To rescue her loved ones she uses sole one arm to wield her deadly sword to sever the limbs from her already grotesque foes. Fans of games like the Infinity Blade series will feel right at home with the game’s swipe based combat and parry system. Short and long swipes are differentiated with long swipes helping to fill a special ‘Focus’ meter which, when full, allows you to deliver a devastating attack on your opponent, allowing you to slash off their limbs for collection. Your enemy’s recently divorced appendages can be collected and used to upgrade Sasha’s sword and skills, increase her precision, ability to leech life from her enemies and more in the game’s extensive RPG-style skill tree. This is a dark game, but its unique are style and somewhat over the top violence almost give it a sort of charm and dark humor. I don’t know how it plays on the Vita, but Severed is a brilliant iOS title with a bewitching story and satisfying swipe-based combat. It is easy to see why Apple chose this as this week’s Editor’s choice. On the PS Vita the game sells for $14.99, so right now at its special launch price of $5.99 (until August 4th), iOS gamers can pick this one up for a great deal. Finally, from Slitherine and developer Cat Rabbit we saw the release of the iOS adaptation of Devil Pig Games’s popular WW2 strategy wargame, Heroes of Normandie. 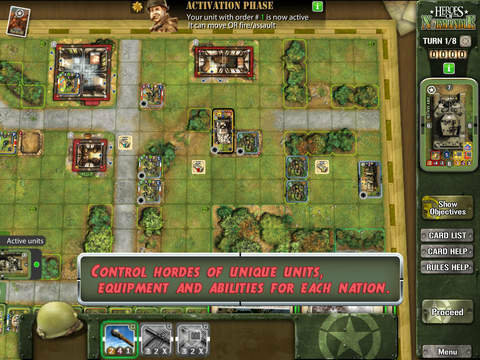 Released to positive reviews last October on Steam, now iPhone an iPad owners get to choose an army (Germans or Americans or even the French Resistance), plan their attacks, give orders, deploy their units and resolve combat with the roll a virtual D6. Inspired by classic Hollywood war movies like A Bridge Too Far, The Longest Day, Patton, Kelly’s Heroes and Saving Private Ryan this is not your typical wargame, offering a different feel and focus. While I haven’t had the opportunity to play either the original tabletop game nor this digital implementation I have heard great things about both. It looks quite good and Slitherine has a strong track record of tactical digital board games releases on both iOS and PC. 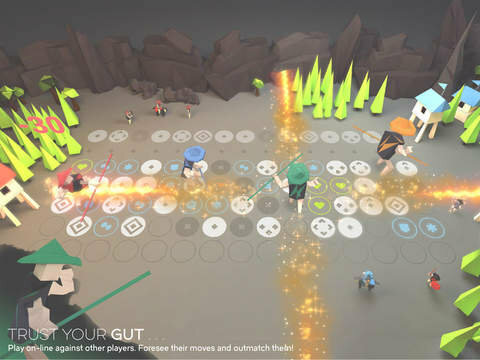 The app features two campaigns and several game modes including asynchronous multiplayer. Slitherine’s apps tend to be on the pricier side, though if you’ve been itching to try out Heroes of Normandie this app looks like it could be a great place to try and learn the game for far less money than the physical tabletop release. And that’ll do it for this week, hope you are enjoying some of these new releases as well.